". . . BeWitness, headed by Maussán, was an absolute fraud, one in which many people paid for something that was utterly false." 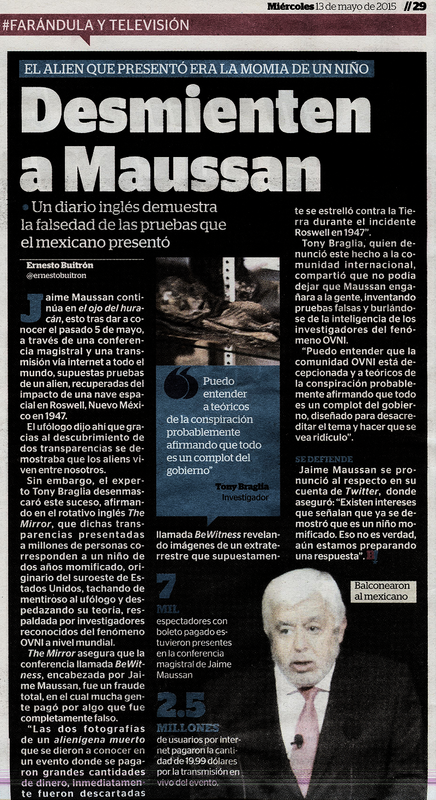 Jaime Maussán remains in the eye of the hurricane after disclosing last May 5th -- through a major conference and Internet transmission to the whole world – alleged evidence of an alien recovered from a spaceship that crashed in Roswell, New Mexico in 1947.
. . . However, . 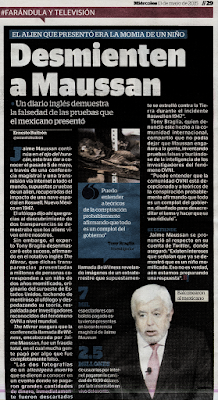 . . British newspaper, The Mirror stated that the slides are those of a two-year-old mummified child from the southwestern United States, branding the ufologist a liar and shredding his theory, which was supported by renowned, world-class UFO researchers. The Mirror states that the conference, called BeWitness, headed by Maussán, was an absolute fraud, one in which many people paid for something that was utterly false.